If Bordeaux is the center of the universe of red wines, then an argument can be made that Burgundy's "Cte de Beaune" is the white wine epicenter. 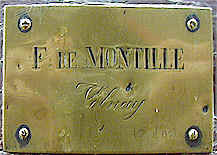 Within that region are the famous Chardonnay-producing villages of Meursault, Chassagne-Montrachet and Puligny-Montrachet. Each village has its particular claims to fame. But Puligny features two of the six Grand Cru sites for White Burgundy and parts of two others. We assembled a line-up of wines from some of the top names of the appellation. The vintage, 1999, produced a large quantity of wine and of good quality. Our tasting group is comprised of a wide variety of palates. 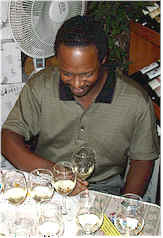 Few of the group has as much experience with these sorts of wines as we do with Chardonnays from the West Coast of the United States. As we discussed our findings, I noted a number of wines were criticized for not being especially "opulent." Of course the soil and climate conditions are different in Burgundy than in California, but well-established domaines are often insulated to a certain degree from having to cater to the tastes of certain prominent wine critics. As a result, we did not find any of these wines to have unfermented residual sugar, nor did we find wines with elevated levels of alcohol. I felt the quality of the wines was very high. While one can debate the price/value ratio of the wines, there is no denying these are of very high quality. Ellen was unable to participate in this tasting. 8th Place: PIERRE MATROT "Les Combettes"
One critic felt this had a musty quality and was astringent. Another agreed it was not clean, showing the "aroma of dirty socks." Someone else was a bit more positive, finding "vanilla, honey, lemon peel notes with shadings of earthy fruit and an infusion of toast and oak...it's not that unpleasant!" Other comments included "tart and acidic," "it's got a green nose on one hand and yet it's overly mature and oxidized on the finish...it's short, yet big but has no focus." "This should be called "Chateau Akron" (a reference to a city in America famous for its production of rubber tires)." said the first critic. A second taster described the aromas as being reminiscent of "Exxon gasoline, with a Unocal mid-palate...it's gasoline!" Another taster felt this wine improved as it aired and warmed. Someone else found it to be a "bit lighter than the rest with honey, creamy, chalky, bread dough notes and an astringent finish." One fellow described it as smelling of "sour vegetables, but it got better with time." I understand the "flaw" the tasters were referring to. Initially this showed earthy and slightly vegetal aromas and it reminded me a bit of pickles. Then it showed a fragrance which reminded me of plastic (the rubber and gasoline others encountered). It's certainly a leesy, toasty wine. I liked the flavors far more than the aromas. It's mildly astringent, but getting past the nose is the major issue here. I'd give it a provisionary "one star" rating. 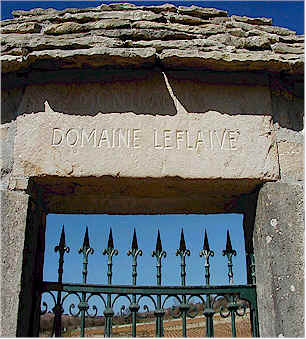 6th Place: LEFLAIVE "Les Folatieres"
The first person to speak said "This wine is much like the LeFlaive Clavoillon." Another person said it "has a burnt taste." Someone else described it as "charred oak." One critic found it to "lack the petroleum notes of the other LeFlaive wine, but it's tart as the dickens!" (If you are a French speaker and trying to translate "dickens," bonne chance!) Another person found "kerosene," while a more positive reviewer found "lemon and honeyed notes, with a flavor of wet stones...smoky and it has a tart finish." I noted the nose as being the most leesy of the bunch. It has lots of very smoky fragrances and burnt toast notes. There's also a toasted nut aroma here. On the palate, this is big, rich, leesy, smoky and very showy if you're a fan of this style of wine. I am, but not many other people were as enchanted by this. I felt it was quite deep and extraordinary wine. 5th Place: JEAN BOILLOT "Clos de la Mouchere"
"I found this a bit musty, thin and unpleasant." said one critic. Another found "lemon seeds, alcohol and tart acidity." 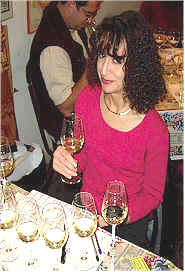 It was the "worst wine of the tasting" for one person, "showing light body, oily, lemon oil notes with some astringency. It lacks fruit and has a woody, resiny finish." Someone else had a much different perspective, finding this to be the best wine of the tasting, saying "I loved this! It's got a long finish, is focused and has lots of finesse." I described the nose as showing aromas reminiscent of ripe pears. This seemed a shade higher in alcohol than the rest of the wines and this bit of 'heat' on the palate made this wine less attractive to me. I like the fruit character, but didn't care as much for the 'feel' of the wine in the mouth. One star. One taster didn't care for this wine, but found "vanilla, some hints of pear-like fruit, bread dough fragrances and tart, apple-skin sorts of flavors...over-blown on the finish." Other tasters also found "green apples" in this wine, one saying the combination of "green apple and grapefruit worked well together." I detected mildly smoky notes on the nose, with mild fruit reminding me of apples. 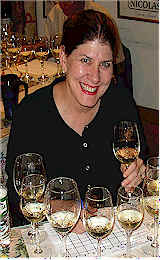 On the palate the wine takes on a more citrus-like quality, showing grapefruit and grapefruit pith sorts of characters. One star. 3rd Place: De Montille "Le Cailleret"
"This is the softest, brightest, smoothest wine, showing peachy notes, some spice and vanilla." said one panel member. Another found "lots of lemon notes without the wine being overly tart...there's also a note of bubblegum here." Someone else found it "clear, polished with wet earth, honey and citrus along with some vanillin." Another taster felt it had "good length and complexity...I'd like a more luscious texture, though." I felt this really struck a nice balance of fruit and smoky/toasty elements. It's got a lovely fragrance. The wine is mildly toasty on the palate, showing a bit of oak and nice, appley fruit. One-and-a-half stars. 2nd Place: SAUZET "Les Referts"
The first taster found this to show "concentrated citrus notes, with a citrus-laced pear quality. Honeyed, it has a healthy dose of oak on the finish." Another person found it to have a "beautiful nose." Someone else described it as "green apples," while another said it was like "Granny Smith's." One person felt "the flavors didn't match the nose and it was more lean than I'd have liked." I found the nose to be terrific! Lots of appley notes and some toasty qualities, too. Mildly smoky...very elegant. The same notes show up on the palate. It's really dry, fresh, crisp and classically "Puligny." One-and-a-half to two stars. 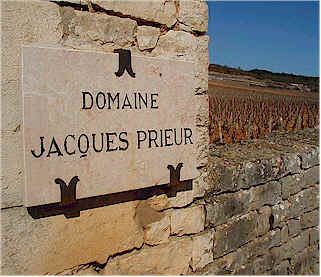 1st Place: JACQUES PRIEUR "Les Combettes"
A runaway winner, this wine got lots of accolades from the tasters. "The best wine," said one, describing it as "fuller bodied, with a silk-sheet like texture on the palate. Lots of honey, vanilla bean and pie crust notes." Another taster described it as being "more reminiscent of California Chardonnays...a crowd pleaser with lots of oak and opulence." I found this to have lots of ripe pear and apple fruit notes. There's plenty of sweet, vanillin oak to this. Imagine: A French White Burgundy that's very fine, but styled along the lines of a California wine!!! On the palate, it's big, rich, dry with deep flavors of the fruit and oak. I'm not certain seasoned tasters would guess this to be a Puligny-Montrachet, but if they guessed something like a good version of Peter Michael, Pahlmeyer, Kistler, etc., they'd not be far from the mark! Two stars.